Would you make a good arborist? Take our career test to find out how you match with this and over 800 other careers. What is the workplace of an Arborist like? An arborist, also known as an arboriculturist, studies the bio-mechanics of trees; growth, cultivation, reactions to pruning, diseases, de-compartmentalization of decay, and all the practical aspects of tree surgery. He or she is also interested in the management and study of individual trees, shrubs, vines, and other perennial woody plants. An arborist’s job is more generalized than a tree service technician, as an arborist cares for the health of the entire tree, much like that of a family doctor. Trees are everywhere and provide people with many benefits. They offer shade, produce oxygen, and provide food. They keep streets and cities cool and prevent soil erosion. They are also very pleasing to look at - people love having trees around them. And just like a person, trees need proper care and nutrients to stay healthy. An arborist provides this kind of care. While trees provide a lot of benefits to people, if left untouched they could cause damage. They may overgrow onto power lines or people's homes. They could also cause damage in severe weather which can lead to power outages and harmful collapses. Tree Pruning - Arborists can determine what type of pruning is needed for individual trees. Pruning promotes healthy growth, rids the tree of any dead wood, and naturally protects the tree from insects. Tree Removal - As a last resort, an arborist may recommend that a tree is removed, though it is always carefully considered. 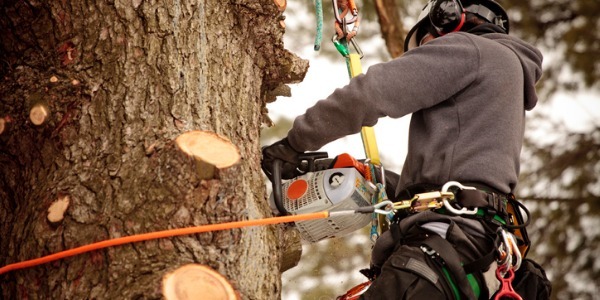 An arborist has the proper skills and equipment to remove a tree safely and efficiently. Tree Planting - Planting a tree in the right place is important for the tree's long term health. An arborist can determine the appropriate location for a tree and assist with planting. Emergency Tree Care - Storms and heavy winds can cause major damage to trees or individual limbs. If a tree is felled, or its branches cause damage to houses or power lines, an arborist is called to make sure the situation is handled properly. An arborist provides other services such as insect control, fertilization, cabling, aeration, and lightning protection. They can also identify any diseases or parasites, ensure trees have sufficient support, and remove any damaging plants. An arborist can give consultations that will help determine when these services are necessary. Are you suited to be an arborist? Arborists have distinct personalities. They tend to be realistic individuals, which means they’re independent, stable, persistent, genuine, practical, and thrifty. They like tasks that are tactile, physical, athletic, or mechanical. Some of them are also enterprising, meaning they’re adventurous, ambitious, assertive, extroverted, energetic, enthusiastic, confident, and optimistic. Does this sound like you? Take our free career test to find out if becoming an arborist is right for you. An arborist will spend most of his or her time outside, working in all all kinds of weather conditions. They are sometimes called out to emergency situations which can result in long working hours, for example, when storms knock down trees, causing transportation blockages or power outages. Working as an arborist is not a seasonal job. In fact, there is a lot of work to do in the colder months when trees go dormant, as that can be the ideal time to prune or cut back trees. Being physically fit and enjoying physical work is an important part of the job.